In 1994, a science-fiction movie called Stargate took the idea of alien portals that allowed people to travel instantaneously across the universe and turned it into a modest success. The notion (and box office gross) was sufficiently interesting enough to be reworked into a hit television series that then became a major franchise. Stargate SG-1 ran from 1997 to 2007, and was soon spun off into Stargate Infinity (2002-2003), Stargate Atlantis (2004-2009), Stargate Universe (2009-2011), and a pair of direct-to-DVD sequels in 2008. Books, video games, amusement park rides, and even a pinball machine spawned from this series, which by the mid-2000s had a sizable crop of very loyal fans. So why not an MMORPG? 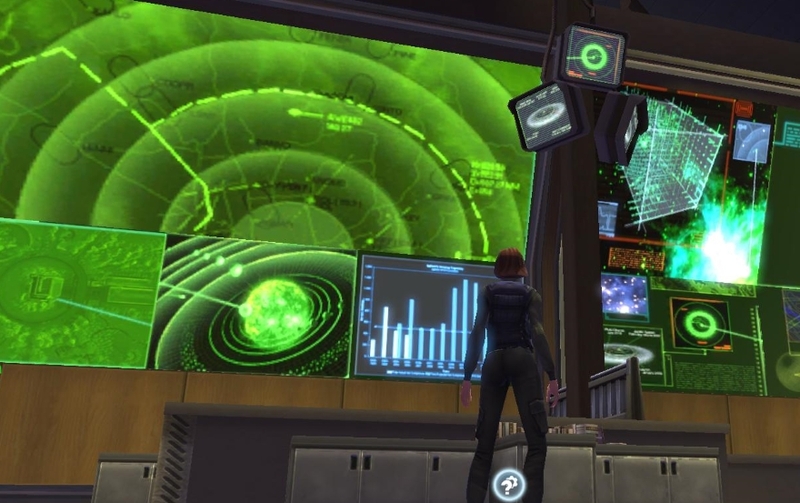 The popularity of the IP would help bolster interest in the game, and the idea of hopping across the galaxy to different planets went hand-in-hand with the virtual world setup of MMOs. In 2006, at the height of Stargate’s fame, work began on such a game — work that would soon enough lead to ruin and heartbreak. This game was Stargate Worlds. The joyous announcement came in February 2006 that Cheyenne Mountain Entertainment was indeed working on creating a massively multiplayer game in the Stargate universe using a modified Unreal Engine 3. MGM had signed the license over to CME back in 2005, and by November of the next year, production was in full swing. The devs were coy about the number of planets slated for launch, but a poll revealed that at least six were being made. The title became immensely popular as a prospective MMO, winning at least one award at E3 in 2006. Cheyenne Mountain Entertainment’s team had ballooned to 100 employees by 2008, some of which had come from other MMO studios such as Blizzard. There was even talk of a second, unnamed MMO in development as well. To the devs’ credit, there was an attempt to not merely mimic a World of Warcraft-type class system that pervaded the industry at the time, but feature archetypes that eschewed a strict holy trinity setup for more flexible roles. These ranged from the non-combat Archaeologists (who would be more involved in puzzle-solving) to the heavy melee hitter Jaffa. The devs promised that there would be quests for each of the professions, although how involved that would have been remained to be seen. All of the major races from the show would’ve been represented, along with one or two that were hinted at but never seen. The devs touched on how players would be able to make long-term choices for their character’s development based on the race they selected. There was discussion about how non-combat classes could participate in fights, such as the Archaeologist distracting mobs through a minigame to the point where the mob despawned without dying. There were also minigames planned for hacking, all of which could be farmed off by players who didn’t want to do it to those who did. Players wouldn’t have rushed to the cap and sat there bored, either. Plans were in place to raise the level cap by two every few months along with an influx of new content and stories. Enemies were designed to be a little more unpredictable, with AI that would change behaviors depending on whether the mob was aggressive, defensive, or something else entirely. And fighting would have required players to use more military-style tactics than normally seen in MMOs. Travel between worlds would be accomplished, naturally, by stargate, although the devs said that spaceships weren’t out of the question for areas not linked by the gate network. And years before “transmedia synergy” became the catchphrase of Defiance, Stargate Worlds was already planning on intertwining its online missions with the stories being told by the shows. Even an Atlantis expansion was rumored to be on the drawing board. Interestingly enough, the television’s showrunners publicly stated that the MMO’s stories would carry just as much weight in the franchise’s canon. The stories would’ve been pushed forward with the help of live events, of which the devs were major fans. “One of the goals that we both have once the game launches and we’re up and running, is to co-tell stories about stuff that’s happening in the show, talking about it in the MMO world and vice-versa,” Creative Director Chris Klug said in 2008. Rumors of problems swirling about Stargate Worlds started to become solid news by 2008. Cheyenne employees reportedly were denied pay, even as the game prepared to enter into its second beta test the following year. Two-thousand and nine didn’t see a brighter tomorrow for the game, however. Its head developer jumped ship to Gazillion, CME struggled to pay its bills, and efforts were shifted from the MMO to a new shooter game set in the same universe. The studio shifted into damage control mode, insisting that work was still being done and that it had obtained enough funding to finish the MMO. This was later revealed to be not the case at all, but a blatant lie told to mislead investors. Even while fans started to get an inkling that Stargate Worlds was struggling in development, there was still hope that the game would somehow make it to the finish line and release. Even the pilot episode of Stargate Universe in 2009 showed a character playing a thinly disguised beta of Stargate Worlds as a teaser for the faithful. FireSky, a CME company, moved in to take the role as the game’s publisher in April. These hopes were cruelly dashed to the ground in February 2010, as word got out that CME had not only filed for Chapter 11 bankruptcy but was scrambling to distance itself from former CEO Gary Whiting. The kicker is that this news came just days after CME had released Stargate: Resistance, a spin-off shooter that focused on PvP and was an obvious attempt to scurry up some cash and keep the fires of fandom alive for the promised MMO. A month later, in March 2010, Cheyenne Mountain Entertainment went into receivership. Employees created new companies to handle the assets (Fresh Start) and well as one to operate Stargate: Resistance (Dark Comet Games). The latter kept that title running until January 2011 (it was later resurrected by fans). Cheyenne and MGM commenced in a legal battle for the assets to Stargate Worlds, a suit that ended in a draw of sorts: Cheyenne got most (but not quite all) of the assets while MGM terminated the IP license for the game. Even through all of this, fans created a website in an attempt to save the game from a final doom. It was ultimately for naught, however. The game settled into its early grave as CME slipped away for good in November 2010, and the legal ramifications shambled on. Gary Whiting and other CME execs were the target of multiple lawsuits, some as recently as 2012. Considering how very close Stargate Worlds came to launching, it’s a digital tragedy of the highest order that it never came to be. Did you get a chance to test this game? Let us know your experiences in the comments! All I ever got to see was the website/front page they used to have that let you hover over the chevrons and make the noises they make. I read it all went down due to some real skeevy business practices/possibly the CEO himself siphoned all the money off. From what I’d seen released, it seemed like a bunch of fluffy talk and not a lot of actual substance though. Too bad this also probably killed any chance of someone else trying with the IP. Ekphrasis Sadly there are rumors about the new movies being a reboot, which will likely utterly destroy my love for this amazing franchise. I played the alpha of this! Knowing nothing about Stargate at the time, I still enjoyed some of the systems. The cover system was actually pretty cool and worked as advertised. As if the recent news wasn’t sad enough, you had to go and dig up this story. Still super butthurt over this one. Stargate is awesome! pepinocantador To be fair, the first movie is fine and would be sick nasty if it was made with modern technology. I don’t think there’s plans to change the movie so much, it’s just the movies afterwards. The show was great, but there was some serious DBZ plot issues when it comes to antagonists. And as much as I like the show, it was a bit on the cheese side with big bads every season pretty much just one upping each other as being even more bad. I had a friend who stepped away from CoH to play the SGW beta – from what he’d tell us, there were niggles but it had potential. Shame they never got the chance. It’s one of the few IPs (outside of Mass Effect) that I would love to play with other people. It’s time for someone to pick up the Stargate IP and do something amazing with it though. Supposedly, there’s a new Stargate movie (currently on-hold while they wait for Roland Emerich to direct it – after he finishes with Independence Day) – and that the new Stargate movie will actually be the first in a trilogy – at least judging from what IMDB says. I still go back and re-watch SG1/SGA every now and then – as background noise while I’m reading/working/occasionally playing games. With the technical advancements today Id LOVE someone to create a Stargate MMO. You’ve been selected to participate in our current phase of Stargate Worlds testing! We are very pleased that you wish to experience Stargate Worlds. Currently, the game is in pre beta phase of development. In this stage of the game’s development, it is critical that we load test our servers. And we need your help! What we would like from you is your presence in-game during each load test (simulation test). During these SIM tests, all we ask is for you to login and spend some time exploring, talking, or fighting! First Step: Download and Install the Latest Build.